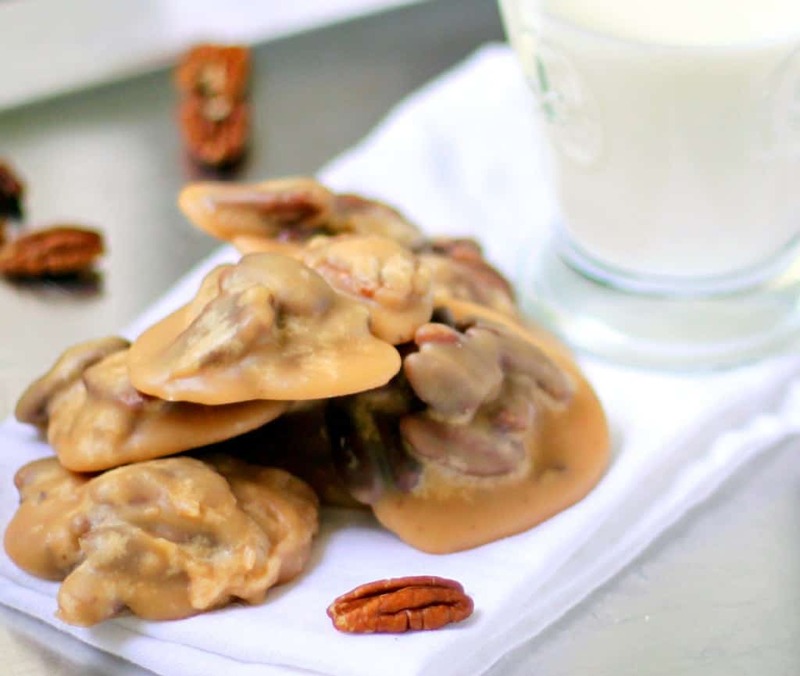 Is there anything better than a warm pecan praline? 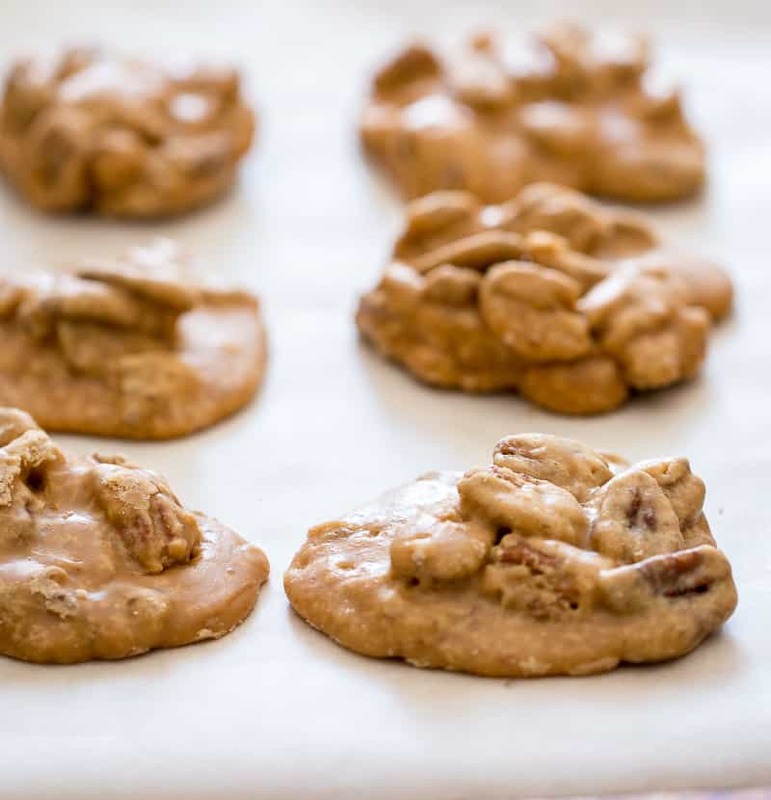 Today we’re revisiting my old fashioned pecan pralines recipe, with some updated photos! I like to tell myself that I don’t like sweets. Most of the time, I even believe it when I say it. Then I find myself walking through downtown Charleston, head down while elbowing through the hordes of tourists, and it stops me dead in my tracks. A smell so sweet, so rich, that the purveyors thought to put their kitchen in the front of the building, and let the rest of the store push beyond it into the back. I tell you, if you have not had a pecan praline before, you have not lived. I tell myself I don’t like sweets, and maybe that’s true. Maybe pralines are so good that even I, the self-proclaimed non-lover of sweets, must still love them. 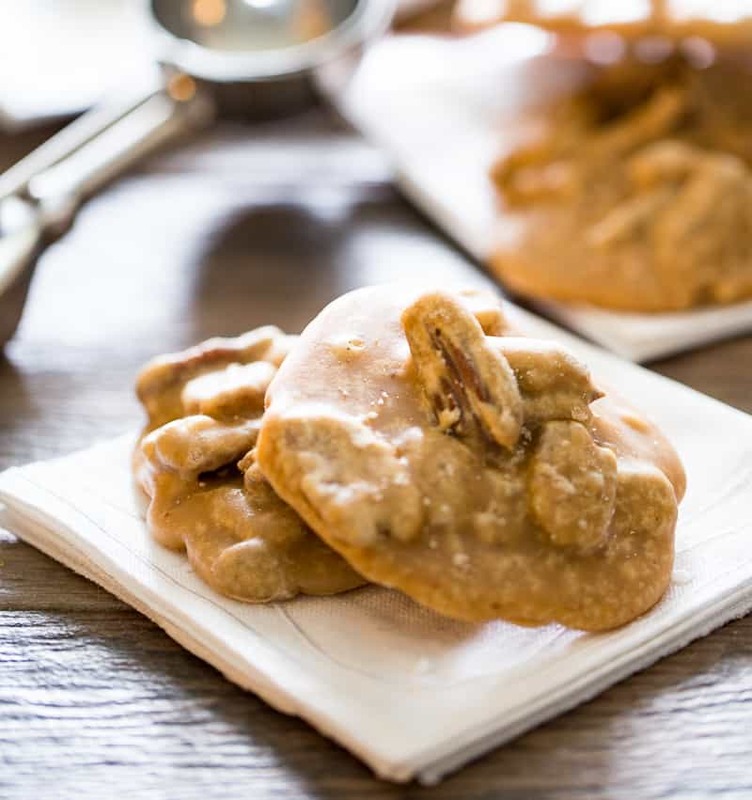 Full of nutty pecans smothered in a butter and sugar bath, pralines are ready to be consumed when they have cooled just about to room temperature, and can be broken into pieces with a quick snap. 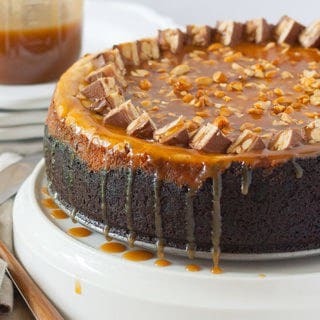 Bite into one with a crunch, but that crunch will immediately be followed by the candy around the pecan melting back into a sugary, caramel-y sauce in your mouth. I used to think that the only way to have these little treats was to brave the crowds downtown and sneak into the touristy candy shop where they are made and sold, but recently I put some time into figuring out what I am sure is their recipe in my own kitchen. You will need a candy thermometer to get that perfect snappy-melty texture, but they can be had for well under $10 anywhere cooking supplies are sold ( even the grocery store! ). 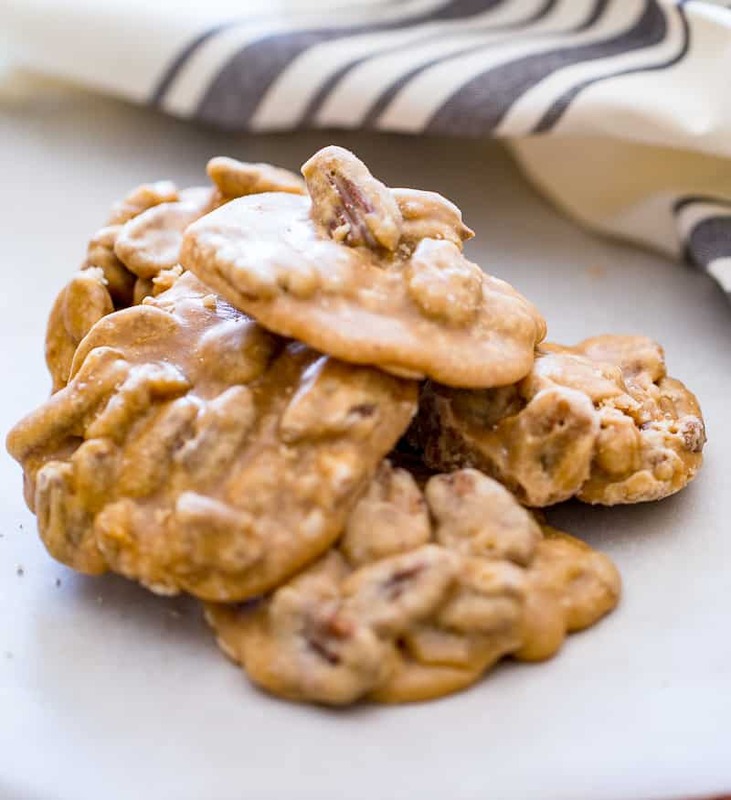 The much sought after recipe for that Classic Southern treat, the Pecan Praline. Toast the pecans ( optional, but delicious ): Preheat the oven to 300 degrees. Place the pecans on a sheet pan and toast for 10 minutes. Remove the pecans and set aside. In a large saucepan with a heavy bottom over medium heat, add all of the ingredients ( including the pecans) and stir. Continue slowing stirring the ingredients as they heat until they are all combined into one syrupy liquid. Resist the urge to scrape the sides of the pan down, as that will add large crystals to your pralines. Stop stirring, and watch the candy thermometer. Once the liquid reaches somewhere between 235 and 240 degrees, remove it from the heat. Immediately whisk the mixture for about 45 seconds, then let it rest for 2 minutes. Using an ice cream scoop, quickly scoop out 15 - 20 pralines on the cookie sheets. They will be ready to eat as soon as they cool ( roughly 10 minutes ). Yum! These would make the perfect homemade gift! I am definitely going to put them in my Christmas tins this year! Yum!! I can’t wait to make these and make my whole house smell amazing! It’s like a brown sugar butter bomb went off when you make them! My husband knew as soon as he walked in the door that I had made something delicious, and came snooping into the kitchen to find out what it was! Oh wow. I know plenty of people in my family that would down these babies. Next time I have a family gathering, I need to whip this recipe out!!! With a glass of milk for sure. I agree, I’m not the biggest fan of sweets, but when I catch a whiff of these…it’s downhill from there! Oh my gosh – those look so good. I tend to try and stay away from sweets (I’m more of a salty person), but I’d be lying if I said I didn’t enjoy walking by some of the candy shops downtown. Charleston, specifically kilwins gets me I’ll spend a fortune on pralines so I am so glad I found this recipe!!!! This is not necessarily true, I guess it depends on your climate. I followed this suggestion and the one that were taken our early did not “turn” The last ones taken out are perfect. Thank you for this recipe! 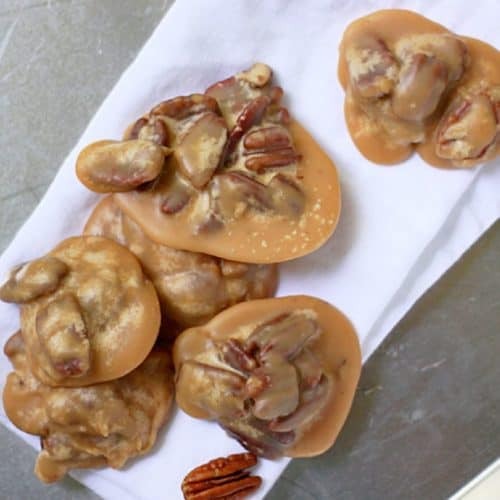 I, too, am a Southern girl with an appreciation for pralines. This one came out right on the first try. They are perfect. Crispness that melts in your mouth. Good job! Wonderful!! I’m so happy to hear that! Does the temp on thermometer vary by altitude? I’m at about 5000 feet. Love this recipe having grown up in the south we had these at every holiday . My pralines came out pretty good the first ones had alot of the candy but the later ones were exactly like i wanted them. Next time i will add more pecans. So easy and were wonderful!! I made two batches of this, however only 1/2 of each batch set. The other half still remained tacky. They still smelled and tasted delicious, but any idea why this happened or how I could prevent this in the future? Maybe let it cook for just 15 or 30 seconds longer so that you can get the entire batch to set? I know it can be so finicky when working with candies! I remember my mom making these as Christmas goodies, thought I’d try my hand and they came out PERFECT first time!!! You go girl???? 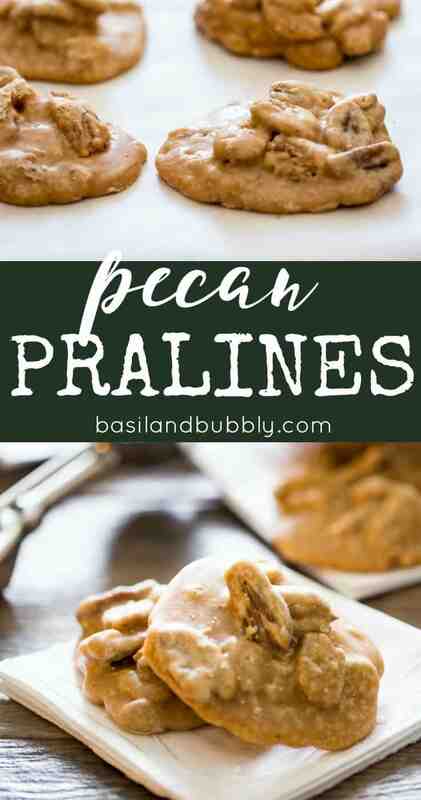 This praline recipe is the best one ever. 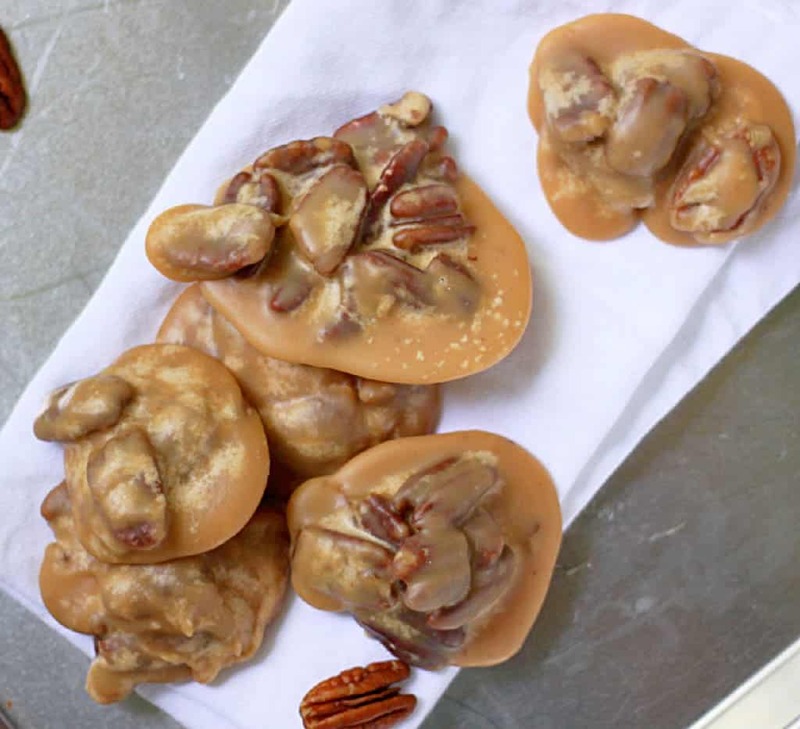 These pralines are exactly like Aunt Sally’s Pralines in the French Quarter!! Fabulous! Thank you so much for sharing this! Follow the recipe exactly as written. Strangely, five of my pralines took longer to set than the others. Can’t wait to try these! Do you NEVER scrape the inside of the pot or do you scrape it at the end? I never scrape the inside of the pot, as that drags the crystals ( which make the pralines more “gritty”) into the pralines. I don’t have a candy thermometer. Can I still make these? 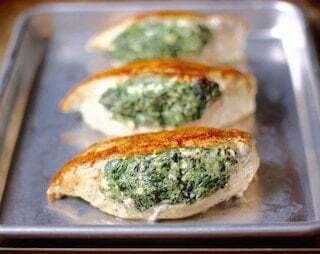 have you ever made these in a microwave? I am so disappointed. I followed the recipe exactly. Used a thick cast iron pan. The entire batch burned. I wish I had stirred them. Threw out the whole thing. I’m sorry to hear that. Did you use a candy thermometer? I got mine to what I thought was 240 degrees which also was marked as the soft ball stage. But mine didn’t harden all the way even after 30 minutes.